Growing up, one of my favourite weekend getaways was a trip to Jasper National Park. Jasper is an easy four-hour drive from my hometown of Grande Prairie, Alberta. 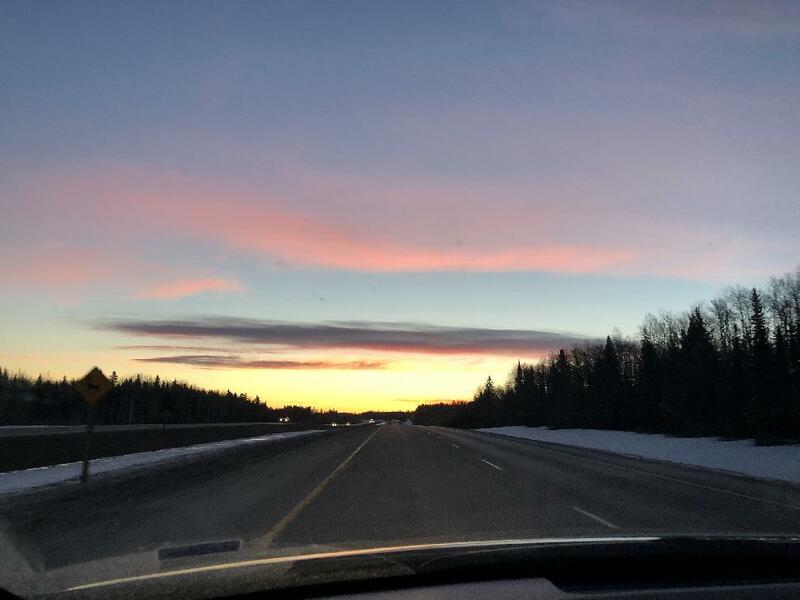 As a teenager, I made semi-annual trips to fortify my snowboarding skills and jumped in the car for the mountain views, wildlife spotting and spontaneous adventures that always accompanied a roadtrip in Northern Alberta. 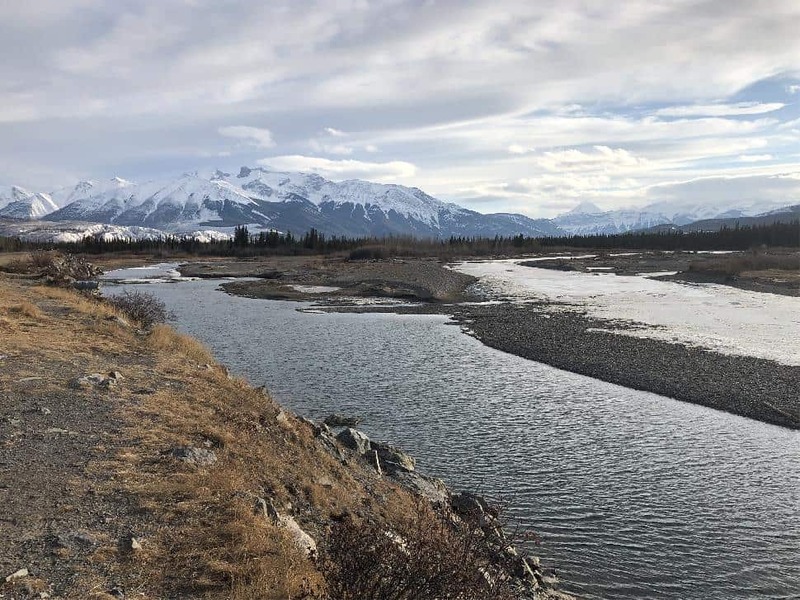 With the support of Tourism Jasper, I was itching to get back and explore these long-loved areas again. Over three days, we went snowboarding, ice walking, skating, hot tubbing and snowshoeing. Check out the video below for a quick compilation of these activities and keep reading for more details on each below. 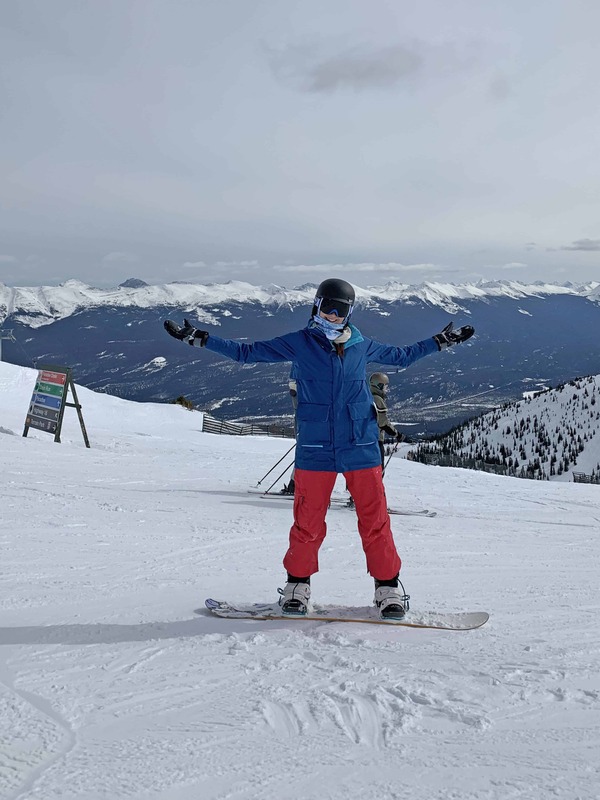 Marmot is one of my favourite places to snowboard in Canada. Scratch that—the world. With the highest base elevation in the country, Marmot starts at 1,698 metres. Grab your day pass and rentals (if necessary) and hit the lifts! My favourite way to experience the mountain is by taking the Canadian Rockies Express Quad Chair all the way to the top of the mountain. From there, I follow blue and green runs down, including Paradise and Punch Bowl. Lunch brings me to cheesy nachos and sweet chicken wings at the cozy Eagle Alpine Lodge. Who says après-ski has to wait until the day’s done? After the lunch rush clears out, I like to soak in the sun while sipping a beer or baileys and hot chocolate in front of the fire at the Paradise Chalet. Exclusive for skiers and boarders, this mid-mountain chill spot is even more relaxed around 2 p.m., so wait until then to pick your spot around the firepit. Back on the hill, I stick to runs like Roll Out and Old Road. But, believe it or not, my favourite is Power Line—a narrow strip of snow that careens through trees and, well, power lines. As an intermediate snowboarder with a fear-inducing past injury, I gravitate towards gently sloping groomed runs with plenty of trees for my friends to play around in. 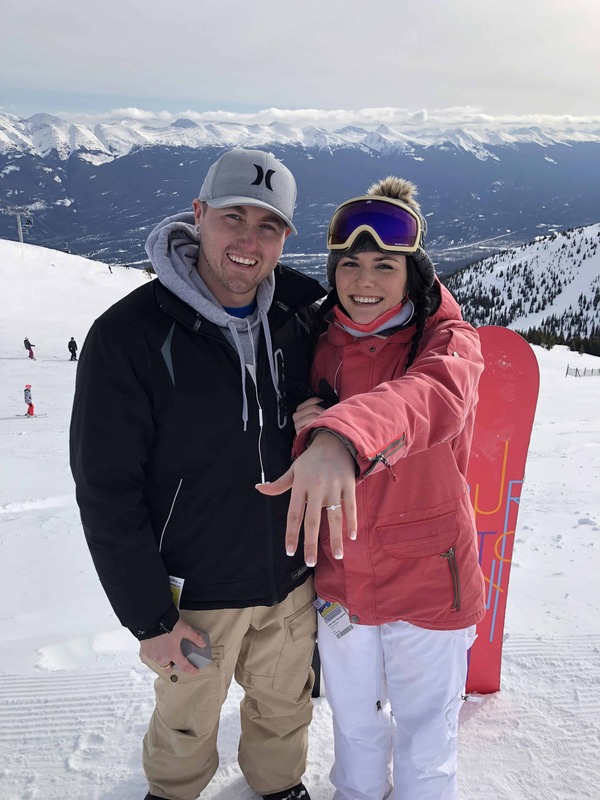 And play they did—after getting engaged on the very top of the mountain! The sun was shinning; the snow-covered peaks beckoning and she said yes. It was a perfect day. 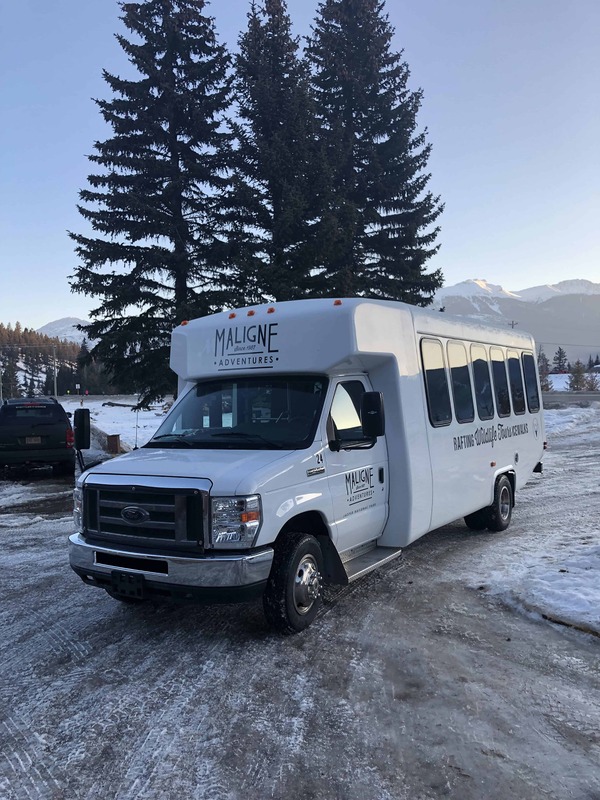 On my second day in Jasper National Park, I was picked up at the Sawridge at 8:45 a.m. by Maligne Adventures. After assembling the rest of our crew—a total of seven for the morning—we made our way to Maligne Canyon. Maligne (pronounced ma-leen) means "wicked" or "cunning." In 1908, explorers tried to cross and nearly drowned in the deceivingly fast flow. Those who have visited in summer know how torrential it can be, but in the silence of winter, it's difficult to imagine the milieu as anything other than halcyon. We hiked uphill for about twenty minutes before descending into the frozen canyon. Provided ice cleats made slipping less likely, but not impossible. Baby blue ice shone beneath our boots as we penguin-walked towards the smooth rock walls. Icicles clung to the side, a result of the underground water system. 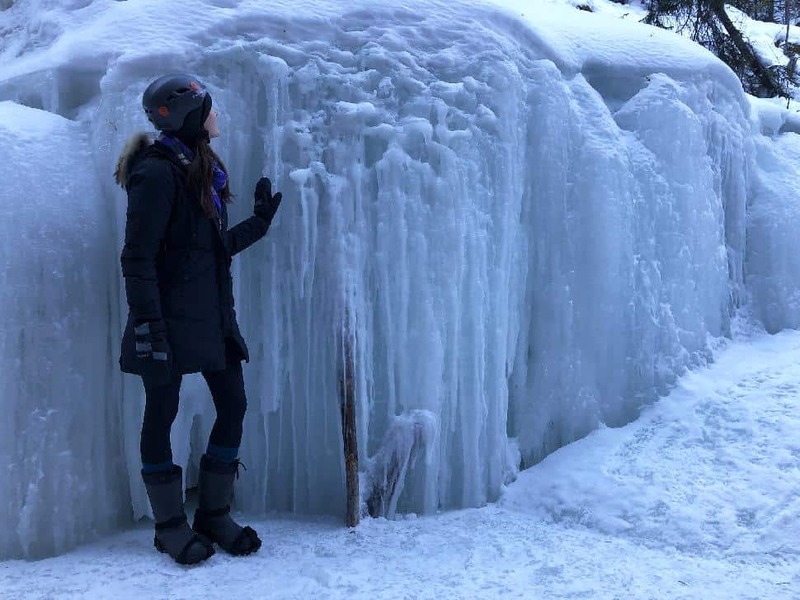 Our guide, Kelly, explained the natural surroundings as we tip-toed into the belly of the ethereal ice castle. Fairy tale-esc awe descended upon me. Looking down, it was nearly impossible to imagine 60 feet of solid ice and a river still moving below me. Looking up, my heart pounded as I imagined the force of rushing water that would fill the cavity in a few short weeks. Although individuals can technically explore this area without a guide, I cannot recommend going alone. 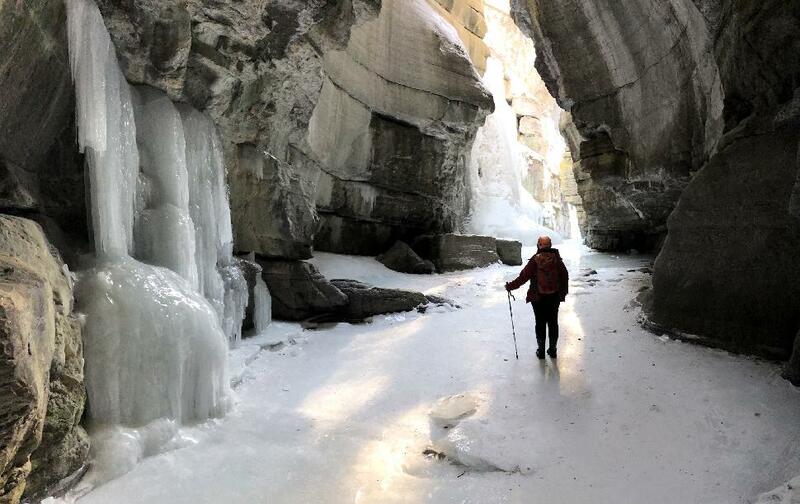 Beyond the practical elements—complimentary rubber boots, ice crampons, the safety aspect of being told where (and where not) to step—the educational elements we received from having a guide were priceless. This was an experience I’ll never forget. 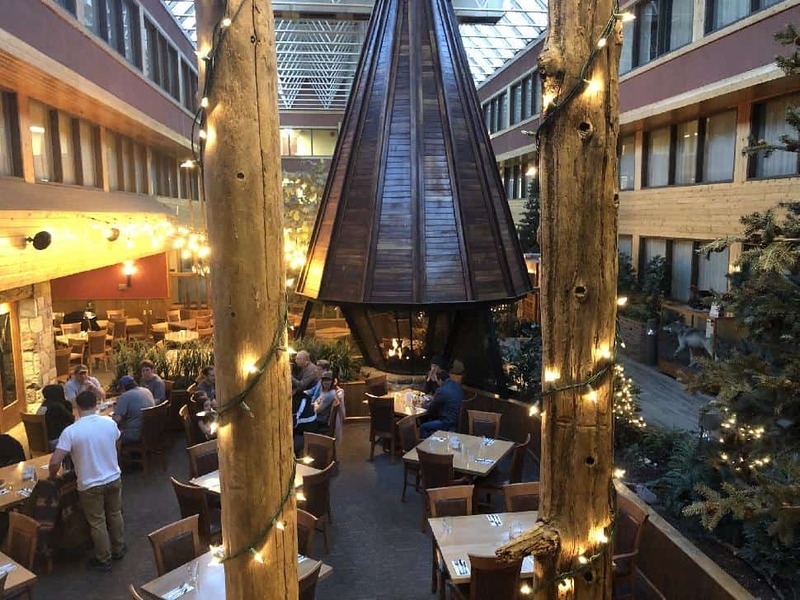 The Fairmont Jasper Park Lodge is a destination all of its own. If you have the luxury of staying here, you can adventure right from your room. We headed to the Club House to rent skates and snowshoes. Lake Mildred's frozen surface features thick white cracks that criss-crossed over aqua-blue ice in extravagant designs. Pyramid Mountain stretched into the clear sky. When we were finished on the ice, we slipped on snowshoes and wandered along the Woodpecker Trail, getting slightly lost on divergent strands. 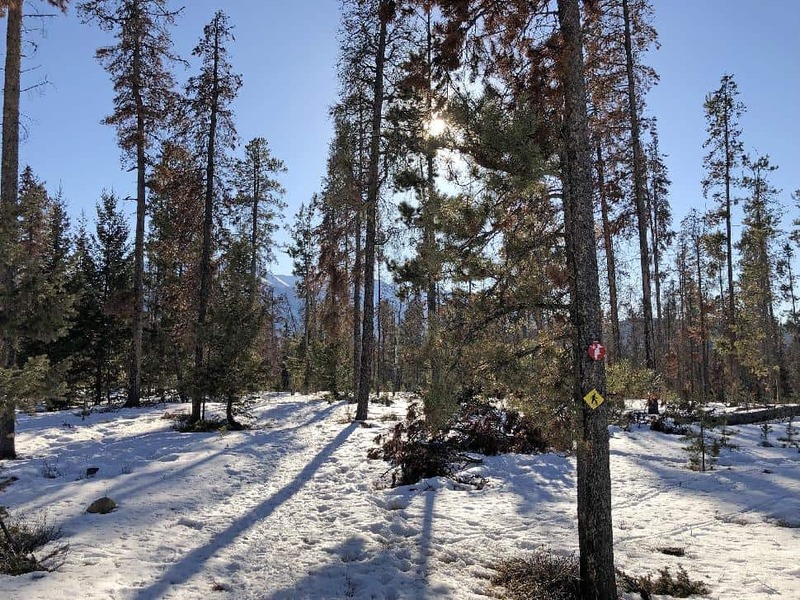 When exploring the snowy forest, you might notice red trees—this isn't the changing of the season, but the result of the cataclysmic pine beetle. Enjoy the colourful views while they last, as this forest will likely go up in flames within the next two years. Back at the Lodge, head to the patio outside the Emerald Lounge for a drink. Then, descend to the pool level and soak in the outdoor hot tub as the sun sets. 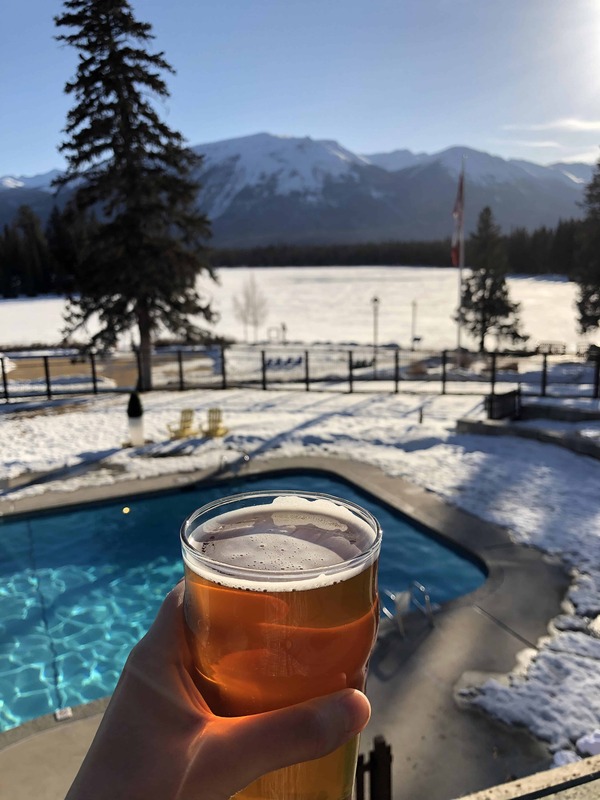 Is there any better way to cap off a winter adventure in Jasper? Bear Paw: My favourite breakfast/coffee stop is Bear Paw—and I'm not alone. A second Bear Paw Bakery has opened in Jasper due to popular demand. Get the latte of the day, a unique drip coffee blend and a breakfast sandwich to fuel up for your adventure. And, if like me, you have a sweet tooth, don't miss the raspberry white chocolate scone. Jasper Brew Co: This casual eatery brews their own beers. Serving typical pub food like burgers and fries, they also have options like steak and salmon. The vibe is communal, so get ready to make friends over a sampler. 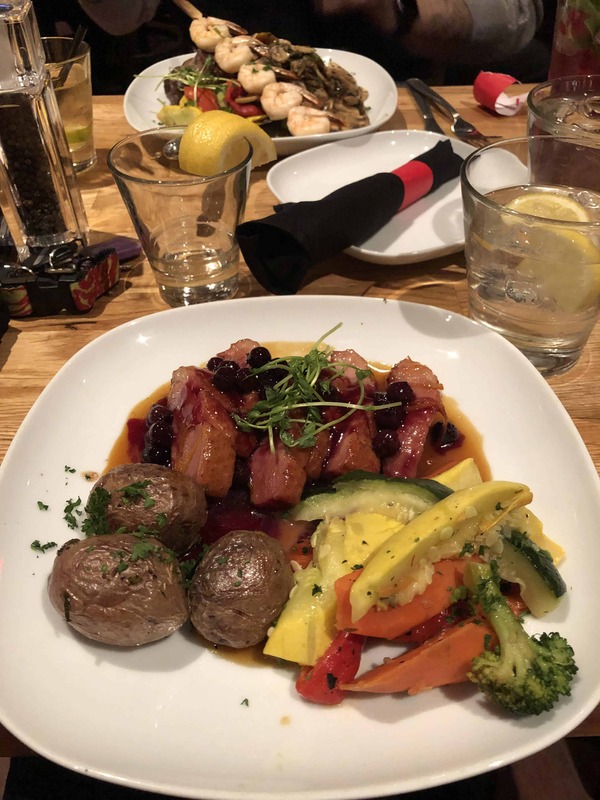 Downstream: Easily my go-to dinner spot, this downstairs restaurant has delicious food on the menu (pictured: I tried the duck), and serves that truly seem to care. Not only did they serve my newly engaged friends champagne, but they also brought out a massive dessert plate with "Congratulations" written in chocolate on the top. That alone makes me a return diner. The first hotel you’ll encounter as you drive into Jasper is the Sawridge. This hotel is a large but unpretentious choice for most explorers. 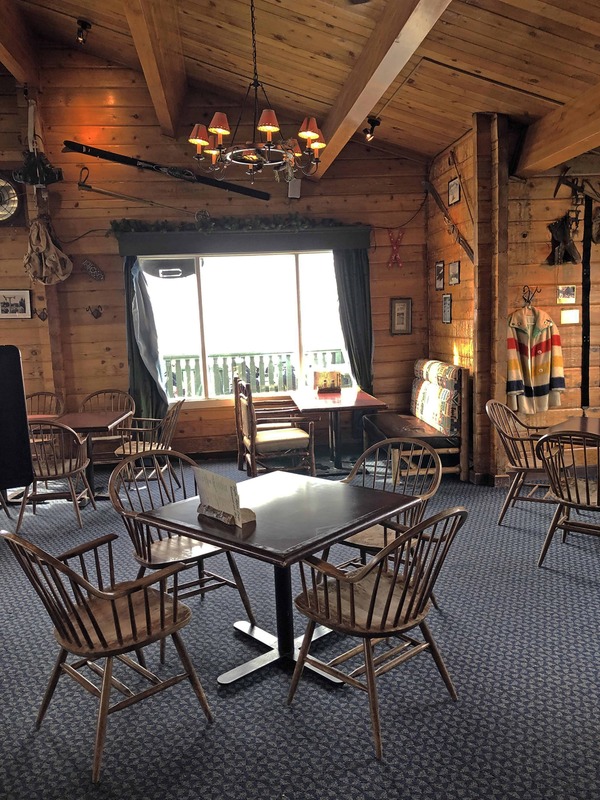 If you’re looking for a comfortable place to lay your head, with filling breakfast options on sight and an indoor hot tub and pool to unwind in, this hotels offers seclusion on the edge of town with easy access to both nature and the amenities in town. I flew from Vancouver to Edmonton, where I rented a car with Enterprise and drove to Jasper. The four-hour (365 kilometre) drive is mostly flat and straight. It’s an easy drive to do alone, as I did; however, there is also a shuttle service for those who don’t drive. 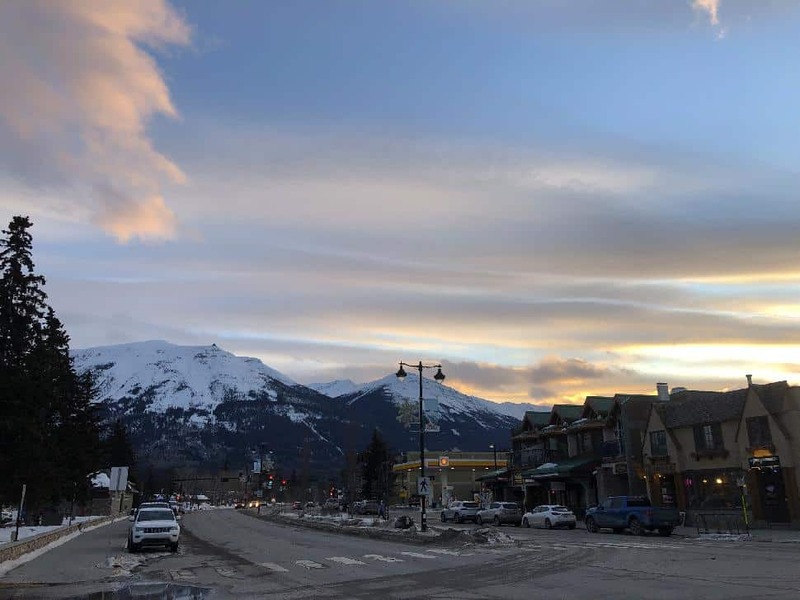 Adventure is in the mountains, but you shouldn’t miss the town of Jasper itself. Unlike Banff, strict regulations keep the community from exploding with new hotels and enterprises. Although the majority of the shops sell identical souvenirs, there are a few hidden gems. Our Native Land is my favourite. 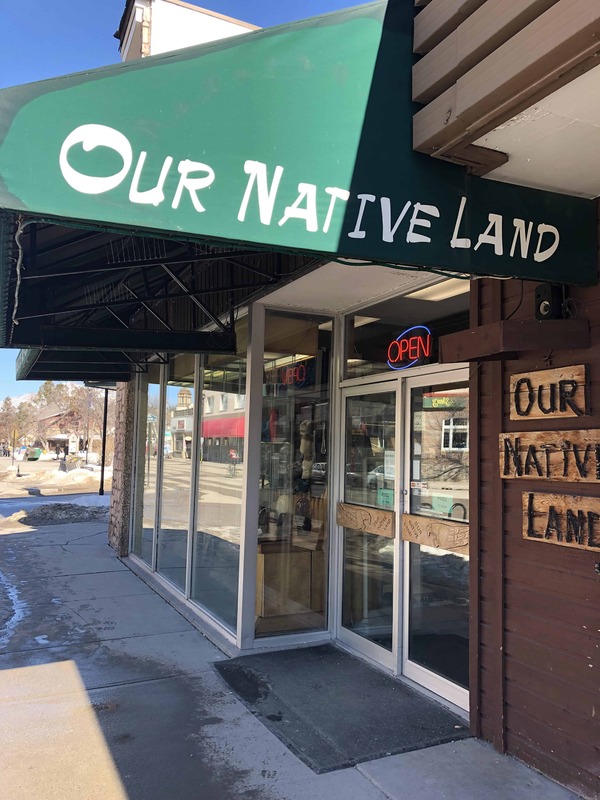 Browse the authentic art, including masterfully carved antlers on display, and maybe find something special to bring home. Disclaimer: some of the activities in this article were provided by Tourism Jasper and partners. All opinions are my own. Have you been to Jasper? What is your favourite outdoor adventure activity in Alberta?